Deep Purple are having a bit of a break from hurtling this year but have booked in some shows in Eastern Europe for December 2019. Sofia, Budapest, Klagenfurt and Ostrava (on the 4th) so far with more to follow. Thanks to Tim Summers for the heads up. Sorry, am I allowed to even write the word Europe any more? The publishers of Wait For The Ricochet have not been able to get this shipped into their warehouse in time for DTB to post out before the December holiday break. It will arrive with the book distributors sometime over the next few days, and we will in turn arrange to have our stock shipped up to our office as soon as it on their stock lists. DTB customers will still get their copies before anyone else, but I do apologise to anyone who was hoping for this in their stocking. America seems to be getting a bit box set crazy these days, all part of trying to squeeze a few more sales out of back-catalogue, and often these can represent good value for money but only if you don’t have the titles already. 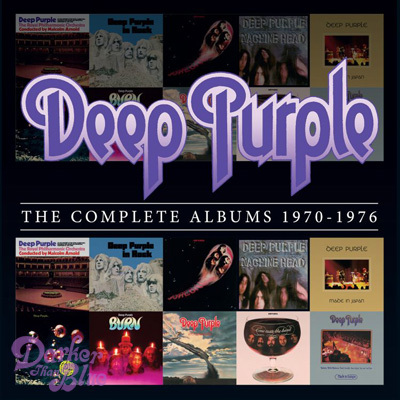 Rhino are jumping in with The Complete Albums 1970 – 1976 (cover shown above), 10 CDs, which runs from Concerto through to Come Taste, with MIJ and MIE as extras. Meanwhile Audio Fidelity are planning their first box set with Gold CDs of In Rock, Fireball, Machine Head and Who Do We Think We Are in a metal box. These have all been out separately, and got good reviews from audiophiles for the remastering. Thanks to http://www.musictap.net/ (which is a useful American site for upcoming archive rock and pop titles and plans) and Leslie Hanagan.